Photo circa 2006, included as Figure 2 in Integral Consulting's Final Removal Action Report for the Former Pepeekeo Sugar Company Property (i.e., Hakalau Point). Report dated 6/18/2014. The 1956 Sanborn Map below shows the location of the Poison Mixing Shed on Hakalau Point. The figure below illustrates the plan for "Capping in Place". 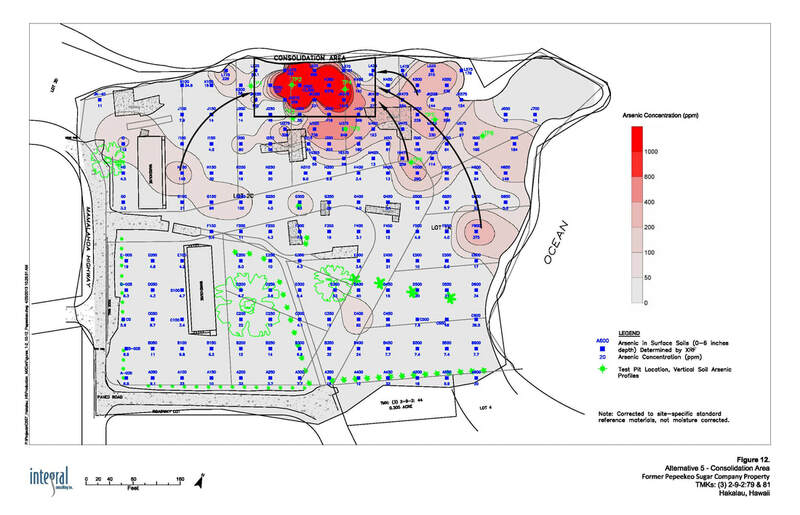 Soil from areas of higher concentration of arsenic contamination will be consolidated in the area of highest concentration of contamination, i.e., the location of the former Poison Mixing Shed. 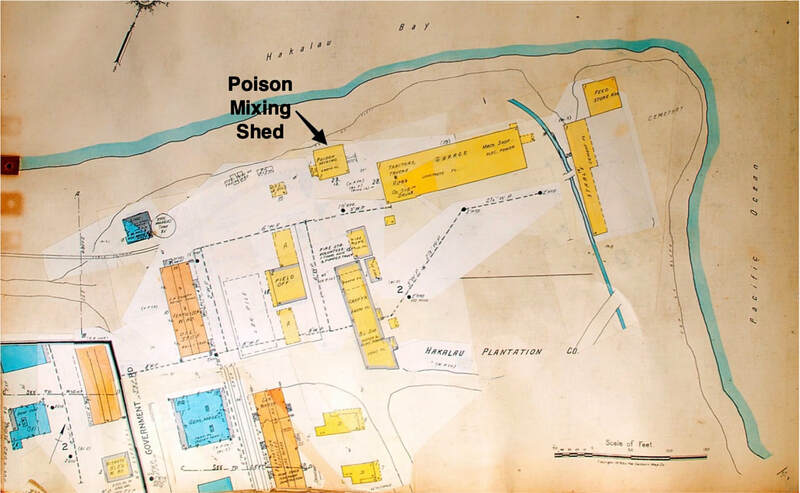 Below, the photo on the left shows the location of the poison mixing shed, the area of highest arsenic concentration. The photo on the right below illustrates the instability of the cliffs. 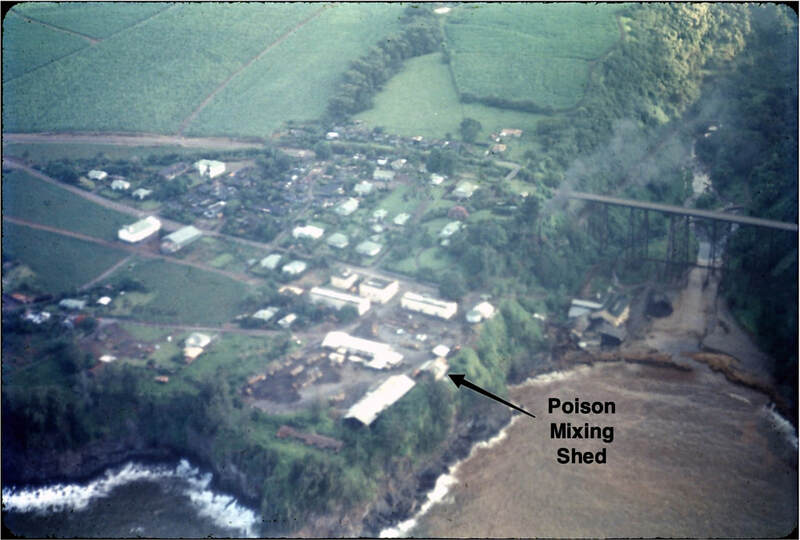 Aerial photo from 1967 showing the Poison Mixing Shed. Photo courtesy of Cal Motoda. 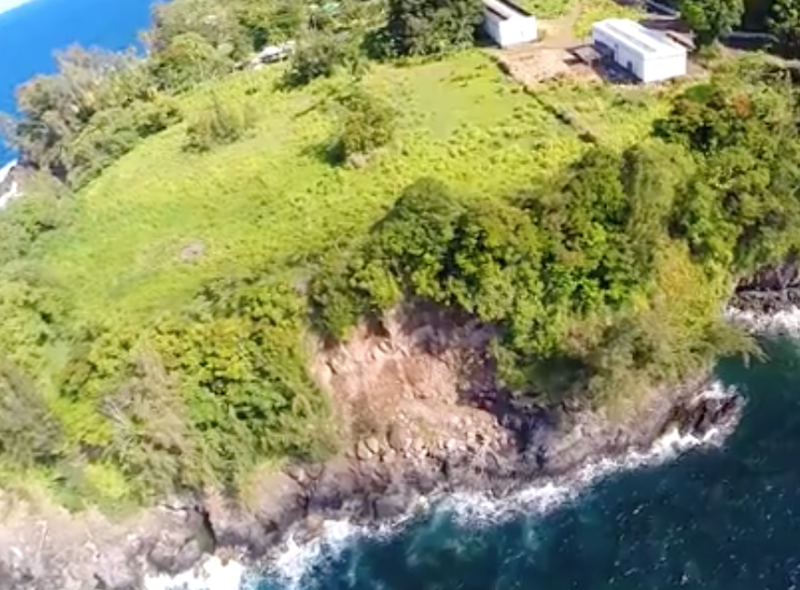 Prior to applying for Plan Approval, the landowner is required to submit a copy of the approved Hawaii Department of Health Hazard Evaluation & Emergency Response (HDOH HEER) Remediation Implementation Work Plan that addresses soil arsenic contamination. Prior to issuance of the Certificate of Occupancy, the landowner must submit HDOH HEER documentation that the proposed remedy has been completed. Further, lead contamination remediation, if applicable, must also be documented. ​As of April 11, 2019, the Remediation Implementation Work Plan had not been submitted for approval to DOH HEER and there had been no word from the developer on exactly when the (approved) cleanup would begin. DOH HEER has asked the owner to ensure the site is not accessible for public use or to use temporary fencing as appropriate to limit access, and has also been advised to not closely mow the site (i.e. let vegetation grow up on site) to discourage use/access by the public, and limit opportunities for any bare dirt on the site. No soil is to be excavated or removed from the site before the cleanup plan is implemented.